Creating 3D colored sand art is a fun and tactile art project! 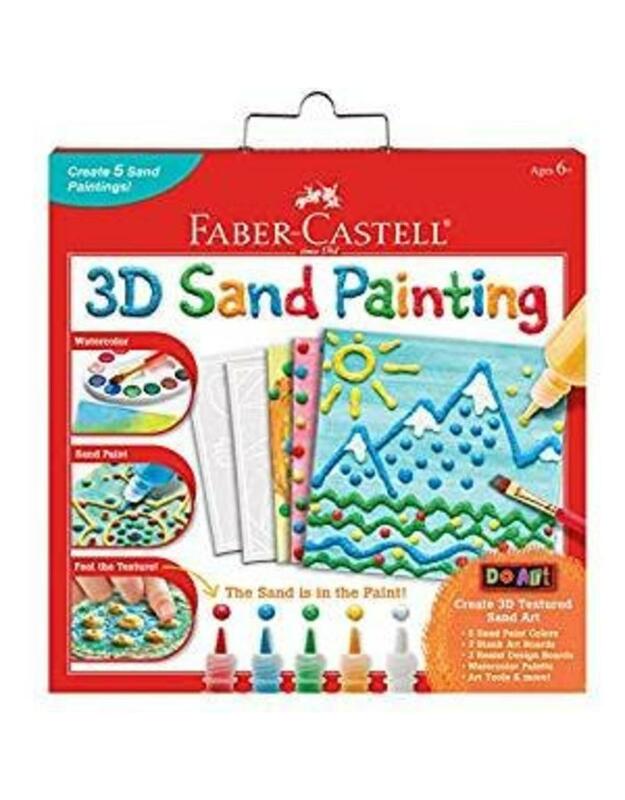 With the Faber-Castell 3D Sand Painting Art Activity Set, you can create 5 sand paintings completely unique to you. This open ended sand art activity kit comes with everything you need! Kit includes: 5 different colors of sand paint, 12 watercolors, 5 art creation boards, texture tool, palette knife, paint brush, loose sand and twist top containers to mix your own colors of colored sand paint. Sand art is a tactile, mixed media project that is great to improve fine motor skills, learn a new art technique and develop color blending and matching skills. Since 1761, Faber-Castell has proudly created premium quality art supplies for artist of all art abilities. Faber-Castell proudly produces children's art products that are non-toxic, kid-tested and recommended by art educators. See your child's art come to life with the very best materials for young artists. The 3D Sand Painting Kit is recommended for ages 6+.